After spending two weeks looking at arch bridges across the Thames, we are moving to Los Angeles to look at their river crossings. Although the Los Angeles River is often dry and has a concrete liner for much of its length, it is a tidal river just like the Thames, at least near its mouth in Long Beach. 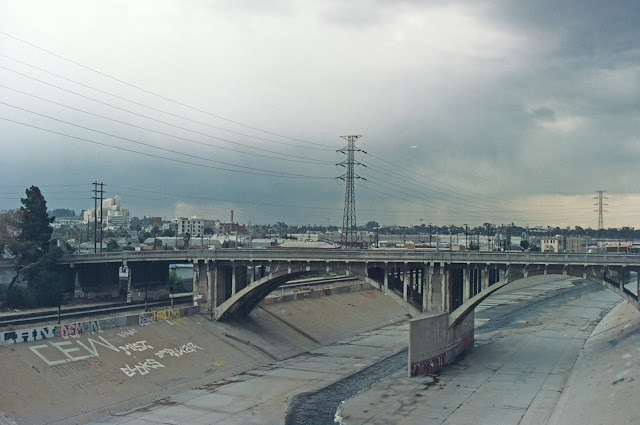 Like the Thames, the Los Angeles River poses a flood hazard to its residents because it cannot carry all the water from the river basin during long heavy rains. Although Los Angeles is far younger than London, it has some well-designed, older arch bridges in the downtown area. We looked at the Broadway Bridge (just north of this bridge) on February 19th. It's the most northern of the arch river crossings (except for the Hyperion Bridge in Glendale) and was built in 1910. In 1874 the Downey Avenue Bridge (named after the governor) was built at this site. It was replaced in 1928 by the current North Spring Street Bridge. It is a long viaduct crossing over railroad tracks and city streets and includes a two-span, open spandrel, deck-arch across the Los Angeles River. It was strengthened in 1939, got a seismic retrofit in 1992, and was undamaged during the 1994 Northridge earthquake. The bridge is 682 ft (208 m) long, 40 ft (12 m) wide, and each arch span is 146 ft (45 m) long. The North Spring Street Bridge isn't as handsome as North Broadway. The approaches are girder spans instead of arches like on North Broadway. The arch ribs are separate instead of continuous and there aren't any architectural details. Note the huge cutwaters they put on both sides of the pier to protect it from debris that can be carried during floods. These walls provide a convenient location to paint graffiti as shown in the photo (you can see the North Broadway Bridge behind North Spring Street in the photo). Los Angeles River Bridges: North Spring Street Bridge by Mark Yashinsky is licensed under a Creative Commons Attribution-NonCommercial-ShareAlike 3.0 United States License.